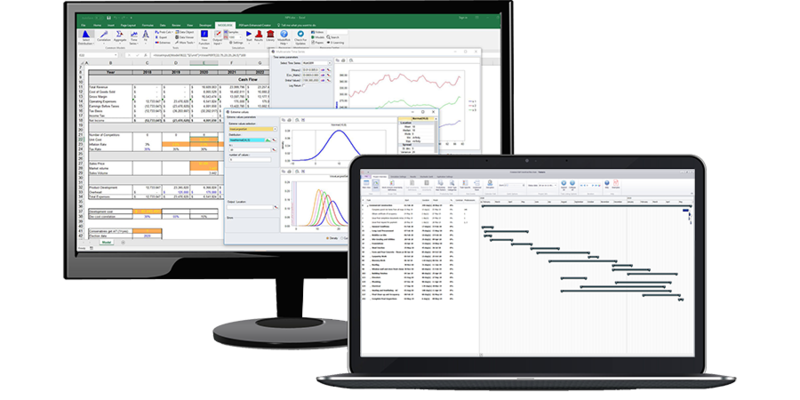 You can use the simulated data from Tamara within an Excel spreadsheet model with Vose Software’s ModelRisk add-in for Excel. By default, Tamara has the Task Start, Task Finish and Task Duration options selected. Tamara will save the files in the same location as the .tam project file has been stored. If you hit the F9 key (spreadsheet recalculate) you will see the numbers change. The Vose SID function is randomly sampling one of the (in this case, 10000) scenarios generated by Tamara. You can add one or both of the other project SID files (start or finish time) to the model as well using the same procedure. Models of essentially any complexity can be built with ModelRisk. For example, you can develop a model to incorporate the financial structure of the project, penalty payments for delays, cash outlay over time, revenue streams for milestones payments, and a discounted cashflow model of the entire investment. Vose Software consultants have a wealth of experience in building such models and can assist you if required. Open the ModelRisk model that uses these SIDs and rerun.